Recorded history typically is the privilege of the famous, powerful and wealthy, and that’s the same for institutions as for individuals. And for the Catholic Church, there’s never been any shortage of preservation of theological documents. For American religious orders, however, an upcoming conference at Jesuit-run Boston College will address a pressing need — the preservation and archiving of their history, typically of grass-roots assistance of the neediest in rural as well as urban areas. Material typically goes missing — and quickly — when orders shut down or dwindle sharply in numbers. “There are a lot of significant parts of Catholicism in the United States, particularly women religious, that don’t have full records,” said Victory Noll Sister Ginger Downey. 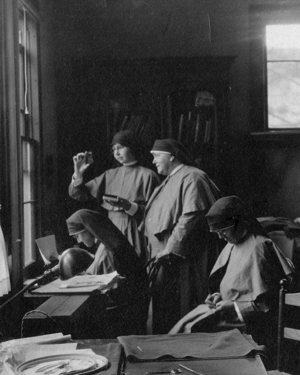 Her order, Our Lady of Victory Missionary Sisters, based in Huntington, Indiana, was founded in 1922 for “a very specific ministry of catechetics” in areas of the American Southwest where there were few priests or nuns. The surviving material can be stunning. “One example is from the Sisters of Our Lady of Christian Doctrine, who worked in South Carolina, although they were based in New York City. The annalist was a gifted writer, and her reflections on President Kennedy’s assassination are amazing,” McGuiness said. Even more recent ministries, such as an AIDS ministry McCarthy knows of that began in 1989, come up short of documentation that show how the daily operations worked. “Unlike the diocesan clergy, (the religious orders) had the ability to respond more immediately to a crisis.